Yesterday, I received an email from the English edition of Paix Liturgique; in it came this interview with Padre Manuel María de Jesús, the superior of the Fraternidad de Cristo Sacerdote y Santa María Reina, which fraternity we have featured numerous times here on NLM. A few months ago in Spain the superior of the Fraternidad de Cristo Sacerdote y Santa María Reina, Padre Manuel María de Jesús, published a little book titled "Motu Proprio Summorum Pontificum, Problem or Asset?" This work was soon translated into Portuguese, showing the interest it has garnered in the Iberian peninsula. This self-published book goes straight to the crux of the issue and is actually breaking the silence surrounding Benedict XVI's liberation of the traditional Mass in Spain as in Portugal. This great silence has been quantified in the survey polls conducted in those countries: in Portugal, according to the 2010 Harris Interactive survey, 74% of Catholics had never heard of the Motu Proprio; in Spain, according to the 2011 Ipsos survey, the proportion reaches 81.7%. Father Manuel's work is deserving. For this reason, we propose the following interview for you to discover the spirit that motivates him; it is deeply concerned with obeying the Holy Father and is filled with joy and gratitude for the discovery of the traditional liturgy. 1) Father Manuel, would you introduce yourself to our readers? Father Manuel: My name is Manuel Folgar Otero--Father Manuel María de Jesús in religion. I was ordained in 1988 for the diocese of Santiago de Compostela where for ten years I was an assistant priest at Saint Joseph of Pontevedra, as well as a hospital chaplain, director of the Legion of Mary Curia and spiritual director of a section of the Ladies' Night Adoration. I taught Religion in middle school for twelve years. I have also been the administrator for a number of rural parishes for the past fifteen years and, finally, founder of a private lay association, the Fraternity of Christ the Priest and of Saint Mary Queen (Fraternidad de Cristo Sacerdote y Santa María Reina). From this fraternity came the Missionaries of the Fraternity of Christ the Priest and of Saint Mary Queen, a public clerical association (editor's note: like the Community of Saint Martin) which is also in formation. It is located in Toledo and I have been its superior since 2009. 2) What is your experience of the extraordinary form of the Roman rite and of the place held by the Motu proprio Summorum Pontificum in your life as a priest? Father Manuel: Given my age--I was born in 1962--I have no memory of the traditional Mass in my childhood, not to mention my youth or later. The first time I ever attended a celebration of holy Mass according to what is now called the extraordinary form was after the year 2000. It was only from 2004-2005 that I got to know the traditional liturgy, during my visits to the monastery of Le Barroux. And in 2007 I was also able to discover the international seminary of the Institute of Christ the King, in Gricigliano, and Cardinal Cañizares who was conferring priestly ordinations there at the time. 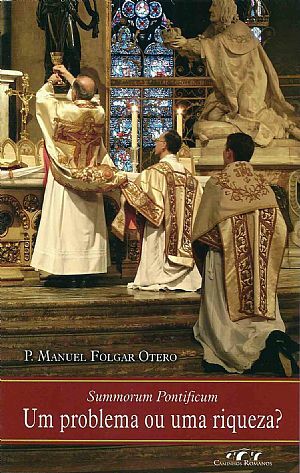 In fact, it was only after 2007, when the Motu Proprio Summorum Pontificum was published, that I began regularly celebrating the extraordinary form. In October of that year, during an unforgettable audience, Cardinal Castrillón Hoyos, president of the Ecclesia Dei commission, encouraged us. Today the extraordinary form is a characteristic of our community and is acknowledged as such in our statutes. My experience has been very positive and, in certain respects, even exciting. I have travelled along the path of discovery of this marvelous treasure that had been hidden from us in the company of my community's brothers as well as with my parishioners. For the older ones it was a rediscovery; for the younger ones, a total novelty. In my various parishes I have never encountered the slightest aversion or resistance against the traditional Mass. This may surprise some people, but it is so. My faithful and I, together, have lived in our own flesh the experience mentioned in the Gospel of the father, a householder, "who bringeth forth out of his treasure new things and old" (Mt 13:52). For us this father was His Holiness Benedict XVI, who opened up to us this marvelous treasure, old yet always renewed, that is the Church's 2000-year-old liturgy, an authentic monument of faith and piety. In my priestly life it has meant an enrichment at all levels: in doctrine, prayer, identification with Christ priest and victim, etc. And also in so many other aspects I need not get in to today. I'll take this opportunity to point out an error. Some people acknowledge that the traditional liturgy can enrich the priest who celebrates it, but deem it to be detrimental to the faithful on the grounds that it would impoverish them spiritually by markedly decreasing or even preventing their participation and understanding of the liturgy. I must humbly say that this does not correspond to my own experience, quite to the contrary. The celebration of the traditional liturgy compels the priest to give greater pastoral attention to the faithful, in the sense of devoting more time and energy to their doctrinal and spiritual formation. This permanent formation rests on teaching the true meaning of "actuosa participatio": the interior disposition to uniting oneself to Christ the Victim through the priest as the intermediary who, as minister of Christ and the Church, renews and offers the Holy Sacrifice. It also rests on the greater care with which one forms one's faithful liturgically and mystagogically. What right or basis do we have to underestimate the laity's capacity to participate in the Church's twice-millennial liturgy worthily and fruitfully? There are laymen with little education from simple backgrounds who could tell a thing or two to any number of those who think themselves learned. These are laymen who have never set foot in a school of theology yet who know by heart the content of the faith and who live out the Eucharistic mystery incredibly deeply and in profound union with Christ the Priest. They draw from their participation in the Holy Sacrifice the force and the inspiration to offer themselves up in turn, in their daily life, as living hosts, holy and agreeable to God. Today, thank God, the faithful can read and follow the texts of the Holy Mass in their missal. They thus associate themselves more perfectly to the Prayers of the Holy Liturgy. This demands a greater concentration and attention than among those who rest content with listening. Behind many of the objections to the Motu Proprio, one finds more ideology than legitimate reasons. 3) In the introduction to your book, you justify your work by the lack of knowledge regarding the Motu Proprio among Spanish priests and, to an even greater degree, laymen. So you are not surprised by the result of the Ipsos survey that Paix Liturgique commissioned just before the WYD, which indicates that 69.5% of Spanish practicing Catholics had never heard of it? Father Manuel: I am not surprised at all. As a matter of fact I find that the result seems to fall short of the reality. I am convinced that the overwhelming majority of the faithful has never heard of the Motu Proprio. And that those who have heard something of it, including priests, do not know its content. There is little to be read about it. The idea that predominates, which is totally distorted, is that the Pope has authorized the Latin mass for Bishop Lefebvre's followers, period. Many are those who spread this equivocation with a view to soft-pedaling the Pope's teaching and to minimizing the importance of the Motu Proprio which, by the way, has force of law for the universal Church and which, as such, dictates authentic rights and duties to be respected by all. Unfortunately, many people satisfy themselves with the sensational headlines that certain media offer and which distort the reality and truth of the report's content. 4) So your book--and its form as well as its content bear this out--principally seeks to make the text of the Motu Proprio and the Pope's desire in liturgy better known. What reception did it have in Spain? Father Manuel: I've tried to do my best. The reception among those whom the book could reach has been very good, even though our means were limited. I self-published the book and, beyond my personal contacts, the book did not elicit much response besides a few sites on the internet. For this type of subject you cannot count on Catholic publishers. They are not interested, it doesn't fit in with their editorial line . . . . Think only that when Bishop Schneider's fabulous book, Dominus Est--which is said to have been so pleasing to the Holy Father--was offered to different Spanish editors for minimal copyrights, none was willing to publish it. I don't know how that would go today . . . . And I am here speaking of Catholic publishers, some of whom are reputed to be "conservative". There again, ideology prevails. It's as though they wanted people not to know too much, not to think for themselves, and to bow to the dominant way of thinking. As sad as it is, it is so. Benedict XVI has often denounced the dictatorship of relativism. Well, one could just as well, I suppose, say that there is a dictatorship of single thought that is present and very powerful in certain circles. Why do some people show so much fear at the idea that people might know, experience, and decide for themselves? Hasn't there been, for many years, a much-proclaimed notion that the laity are now adults? Couldn't we let the faithful decide, and stop throwing spanners into the Holy Father's decisions? 5) In your chapter 9,you insist on the necessary unity of local churches with Rome. Only one Spanish prelate, Bishop Ureña Pastor, has celebrated the extraordinary form in his diocese yet. Can one hope that other bishops will soon follow his example? Father Manuel: To date, two other Spanish bishops seem also to have actually celebrated the extraordinary form, although this took place in near-secrecy: during WYD. No announcement, no reports. Nearly the only ones who attended were those who were sure to do so as they belonged to groups linked to the extraordinary form. I do not know whose responsibility this situation was, but I won't allow myself to believe that this was done in bad faith. I don't imagine that other bishops will soon celebrate the traditional Mass in their dioceses, especially since there does not exist any significant demand on the part of the faithful, the religious, or priests. Yet many priests acknowledge that they dare neither learn nor celebrate it out of fear of uncomprehending criticism. In Spain, we are at the Nicodemus stage: we learn to celebrate secretly . . . . There is no arguing against facts. And the facts tell us that it is up to the most determined and convinced laymen and priests to move things along. I do not know the Holy Father's innermost thoughts, but it seems that with the Motu Proprio the Pope has freed the argument from bishops' arbitrary decisions. These last years Rome has consistently insisted on the "right of the faithful" to participate in the traditional liturgy, not on the right of the bishops to authorize it or not. The highest liturgical authority is the Pope. It is Benedict XVI who promulgated the Motu Proprio and seized the occasion to recall that the traditional Mass was never officially forbidden. This leads me to think that wherever it was in effect forbidden, this was in defiance of the law. Local churches are called to live in affective and effective communion with the Mother Church of Rome. This communion is expressed and manifested in an excellent way through the liturgy. Without a doubt, in every diocese, the bishop is the supreme responsible person for the liturgy, an office he must fulfill in perfect communion and harmony with the Apostolic See. This is precisely why the Motu Proprio in no way diminishes the bishops' authority. Another monumental outrage consists in claiming that the coexistence of different liturgical forms jeopardizes ecclesial communion. This argumentation is easily refuted both from an historical point of view and from concrete reality. It is enough to consider the richness of the diverse Oriental and Latin rites. Who can seriously claim that such diversity jeopardizes the unity of the Church? On the contrary, the unity of the Church is under attack when truths of the Faith are denied, when the Magisterium is questioned, when the Vicar of Christ is disobeyed or whenever someone appropriates the liturgy for himself as though it belonged to him, "making it up" for himself outside of the Church's laws. There are also some bishops who explain that in reality there isn't a sufficient number of the faithful requesting celebration in the extraordinary form. This sometimes happens to be true, at least in Spain. It is also true, however, that one cannot ask for what one does not know. Now, today, many are those who are unaware of the very existence of the extraordinary form and, for that reason, cannot freely express an opinion. 6) Getting back to the Ipsos survey conducted for Paix Liturgique: what do you think of the figure of 50.4% of practicing Catholics who declare themselves ready to attend the extraordinary form at least monthly if it were celebrated in their parish, without taking the place of the ordinary form? Father Manuel: It does not surprise me per se. I even believe that the actual percentage of attendance might be higher, as I have noticed that wherever the extraordinary form is celebrated--after forty years!--the faithful are filled with wonder and ask to be able to attend again. They do not understand how such a treasure can remain hidden behind a bolted door. And I am speaking of laymen of all ages. It is very strange to see how much children like the extraordinary form. The traditional Mass is especially attractive to altar servers; likewise to young people who are particularly sensitive and disposed to beauty, the sense of mystery, adoration and contemplative silence. I must also say that a preliminary formation and a veritable liturgical catechesis are required to rediscover all the symbolic, doctrinal, and spiritual wealth of this liturgy. The faithful are delighted by it. Father Manuel: I'd like to thank Paix Liturgique for this interview. As its name indicates, it seeks to attain liturgical peace and, above all, peace among hearts, which is the fruit of justice. And it is a work of justice to respect the rights of the faithful and to give the traditional liturgy its rightful place! This is how our dearly beloved Pope, Benedict XVI, puts it in the letter accompanying the Motu Proprio Summorum Pontificum: "What earlier generations held as sacred, remains sacred and great for us too, and it cannot be all of a sudden entirely forbidden or even considered harmful. It behooves all of us to preserve the riches which have developed in the Church’s faith and prayer, and to give them their proper place." To obtain the book (in its original Spanish version), you can send an email to: santamariarenet@hotmail.com or call at: 0034 619 011 226.